The relationship between the marching bands at the University of Arizona and Grambling State University goes back a long ways. This was the year of what is now known as Super Bowl I. The Pride of Arizona and World Famed Tiger Band took the field in an act of solidarity. Read the full article at AZ Desert Swarm. After having performed with the Pride of Arizona Marching Band and Pep Band during his undergraduate and graduate years, University of Arizona alumnus Chad Shoopman will make his directorial debut at this weekend’s football season opener. The following message is from incoming UA Director of Athletic Bands, Chad Shoopman, to the current and future members of the Pride of Arizona. 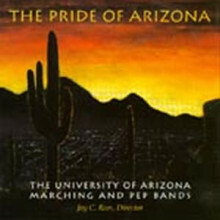 It is a distinct honor to be selected as the Director of the “Pride of Arizona”. It is a tremendous opportunity professionally and it affords me the unique chance to come home and lead a program that truly helped shaped my life. 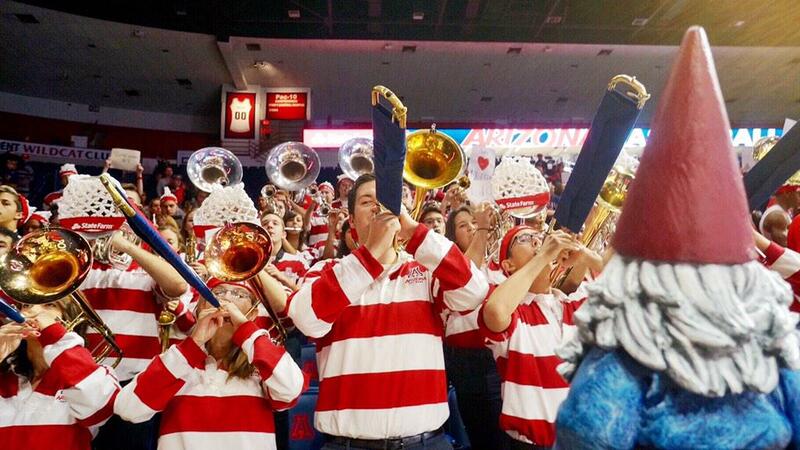 As a University of Arizona Alumni (’96, ’99), I was a member of the POA for 4 years, the first 2 as a trumpet player and section leader. The last 2 years I was the drum major. I went on to become a Graduate Teaching Assistant for Professor Jay C. Rees in 1996 & 1997 (Pink Floyd & Smashing Pumpkins) and I had the privilege of taking the Pep Band on the Sweet 16 leg of our National Championship run in 1997 under Coach Lute Olsen. These are great memories that I will cherish always. I am a Tucson native. I attended Donaldson Elementary, Cross Junior High, and Canyon Del Oro High School. My parents still live in Oro Valley, as does my sister, who is an amazing music educator and choir director at Wilson K-8 School. My journey home took 17 years and included a wealth of experiences working as a professional conductor, trumpet player, arranger, and clinician. As I further developed my passion for the transformative power of music, particularly through music education, I gained real-world appreciation for the impact that creativity and performance excellence can have on people. I am truly excited to return to my alma mater and share that experience with you. I appreciate that changes in leadership can be hard but these changes also represent a unique opportunity to hear new ideas, experience new ways of thinking and, they frequently help us grow as people as well as musicians. As a freelance musician, including my work at Disney, I quickly learned that change is a constant; with new leaders bringing new approaches and fresh ideas that pushed me to adapt, realize and embrace their vision to the best of my ability. Even during my time with the “Pride” I had the privilege of marching under 3 different directors….each bringing with them their own unique talents, styles, and expectations. Looking back I appreciate how these changes impacted my life in a profoundly positive way. So as we begin our new journey together I ask you to embrace the possibilities of this change. 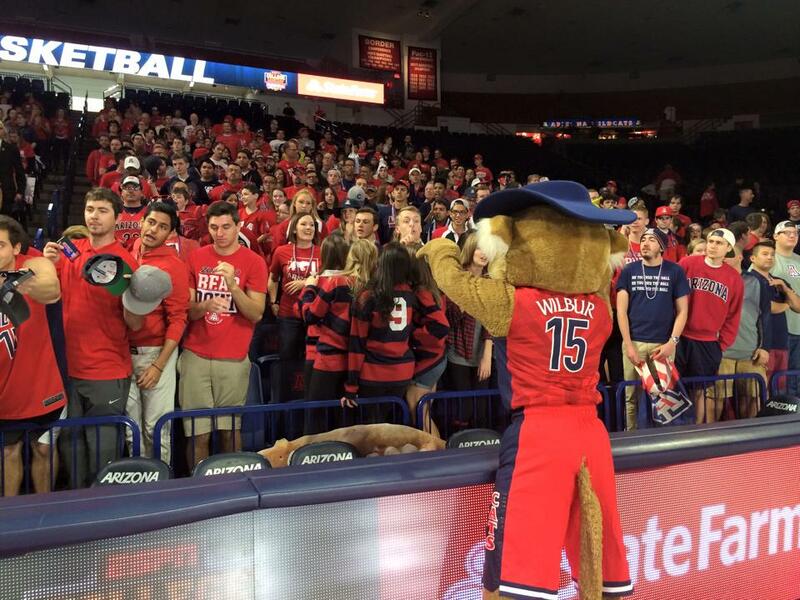 Rest assured that I care about your experience in the “Pride of Arizona” more than anything else. This band has always been about the students. It is the experience you have and the growth you will experience that inspires me. I trust in the power of what music can do through you and for everyone that experiences the “Pride”…it will be great and it will be yours! The expectations I have for you will be nothing short of your best at all times. If we cannot do something to a standard of excellence beyond any other, than we don’t do it. I expect 100% from each and every one of you. You will get 110% from me. With your commitment, our journey will bring unforgettable experiences, opportunities, memories, and friendships that will last a lifetime! I will be visiting campus April 8th – 11th and April 27th – May 9th to take part in section leader and drum major auditions, and to make preparations to hit the ground running this summer. I look forward to speaking with each of you soon. We have a great opportunity to build on the tremendous reputation of the POA, a reputation earned by so many who came before us. We will build on their great work, and together we will take the “Pride of Arizona” to even greater heights in the years to come! The Pride of Arizona is excited to announce that our 2014 Daft Punk show was chosen by CBDNA (College Band Directors National Association) to be presented at their National Conference in March 2015! This is a prestigious honor, as they only select 10 bands out of the many, many colleges that submitted videos. Thanks to Jay Rees for the great arrangements, Sean Rees for the awesome drill, and the dedicated student performers for their never-ending hard work. 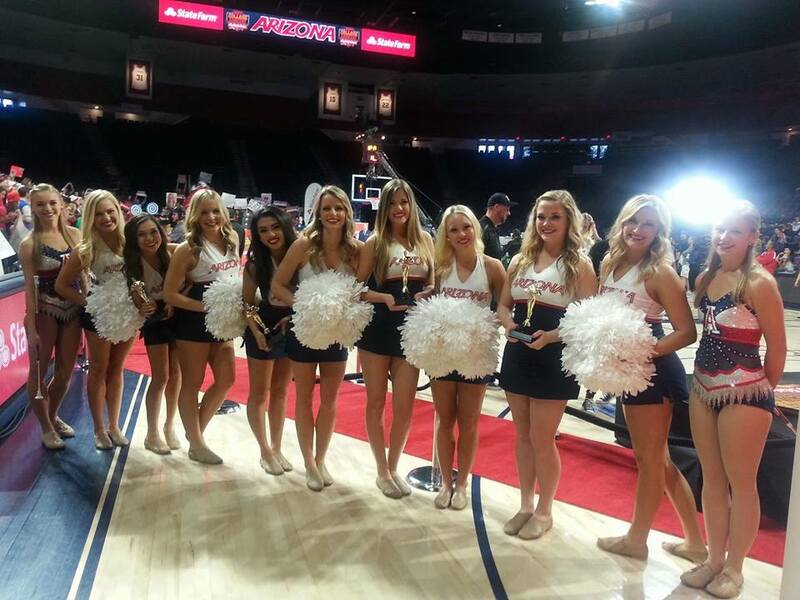 ESPN’s flagship broadcast took over the McKale Center on February 21, and the Pep Band, Pom Line, and Twirling Team were there in full force. 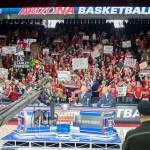 The Tucson community combined with the ZonaZoo to show why we have the best fans in the nation! 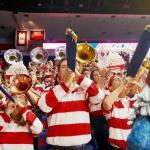 The University of Arizona College of Fine Arts and School of Music is excited to announce the appointment of Alli Howard, Assistant Professor of Music, as Interim Director of Athletic Bands for 2014-2015. 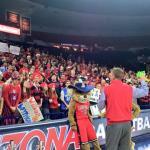 Professor Howard will serve as Director of the Pride of Arizona marching band and assist the UA Pep Band. 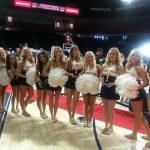 She will also teach courses in Marching Band Techniques and Leadership throughout the academic year. 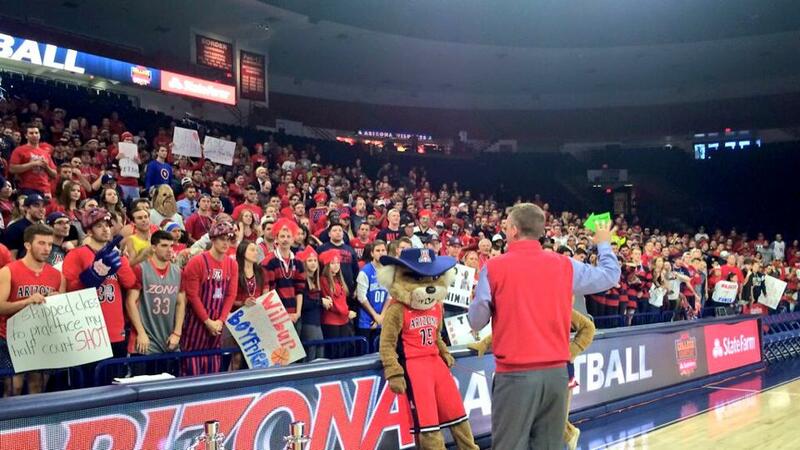 Howard previously served as Assistant Director of the Pride of Arizona and Director of the UA Pep Band last year under former Professor Jay Rees. She brings an extensive amount of experience as a music educator and mentor, and plans to continue the tradition of excellence that earned the UA Athletic Band program its reputation as one of the finest in the nation. 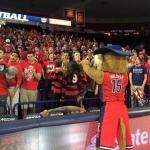 “I’m honored to be named Director of the Pride of Arizona. Being a part of this ensemble was such an important chapter in my life, and in many other people’s lives. I take this responsibility very seriously, and I want these students to have just as an intense and life-changing musical experience as those who were here before them,” says Howard. She also has a message to the members of the band for this fall. Alli Howard earned her Bachelor’s degree in Music Education in 1999 from the University of Arizona, studying saxophone with Michael Hester and Kelland Thomas. During her undergraduate studies she performed in the Wind Symphony, was the Drum Major of the Pride of Arizona, played in the saxophone choir, and sang in the Pride of Arizona quartet. In 2004 Howard earned a Master’s degree in Wind Band Conducting from the University of Arizona, studying with Gregg Hanson. She was also a Graduate Teaching Assistant for the band department. Before her appointment to the University of Arizona, Howard served as the Director of Bands and the Fine Arts Department head at Rio Rico High School, and also as the Band Coordinator for the Santa Cruz Valley School District in Rio Rico, Arizona. In her six years at Rio Rico High School, Howard taught marching band, color guard, symphonic band, jazz band, music theory, and sponsored the school Tri-M chapter. Under her direction, the Rio Rico band program grew from 55 students to 75 students, the RRHS Winter Guard was created, the Rio Rico Jazz Ensemble earned the Judges Most Outstanding Award at the 2012 Highland Jazz Festival, and the Rio Rico Marching Hawks represented Arizona in the 2007 National Memorial Day Parade in Washington, D.C. The Rio Rico bands consistently earned ratings of Excellent and Superior at festivals. In 2012 Howard earned the Santa Cruz Valley School District Teacher of the Year Award. During her twelve years of public school teaching, Howard has also been a guest conductor and adjudicator for elementary and middle school bands. She is an active member of AMEA, serving for four years as the South-Central Region Solo & Ensemble chair, and briefly as AMEA Member-at-Large.